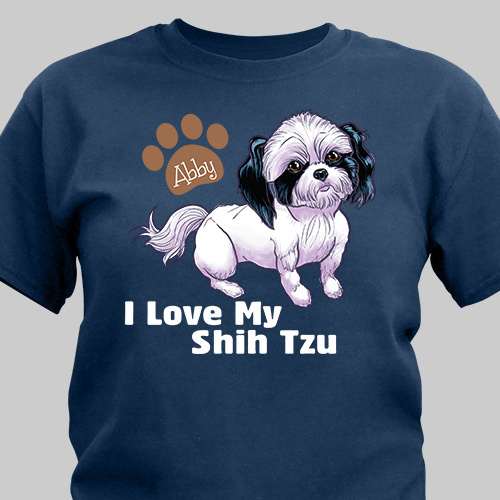 Give the shih tzu owners you know and love something to smile about when you present them with one of these Personalized T-Shirts! Our creative design and personalized touch of the pet's name will make this tee one that dog lovers won't be able to resist. Our I Love My Dog Persoanlzied Shirt is available on our premium 100% cotton t-shirts, machine washable in adult sizes S-3XL. Free personalization of any name is included. Candy is my new addition I love her to death. First time buyer. Very nice shirt and fast shipping! I bought this for my landlords birthday,he has a shitzu and he absolutely loved it! He said where did you find this? I asked him if he wore it yet and he said he wants to keep it as a memorabilia and he also said he showed all his friends. I knew when I saw it he was going to love it! Additional Details This is one personalized pet gift that shih tzu fans would want to receive for any occasion. They'll love having a special t-shirt that shows off their precious pet to the world. 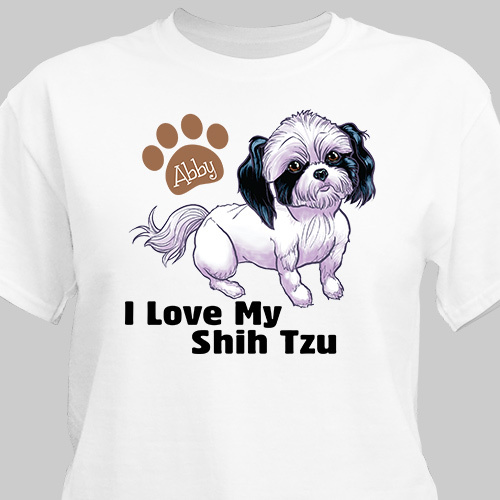 Our Personalized I Love My Shih Tzu Key Chain is a great accessory that would complement this t-shirt well.